Another good day with no side effects or pains during the day. This is day three since taking Pomalyst which in the past showed side effects by this time. The only pain I encountered was my shoulder pain because of the extended walking activities without my walking sticks. I normally use a cane during regular walking and walking sticks when going for my exercise walks. I guess there is a difference that is noticeable and causes pain in my shoulder. Something to work on to figure out. Activity wise I already mention the difference in my walks. Today I spend a lot of time walking as part of shopping or taking PICTURES. 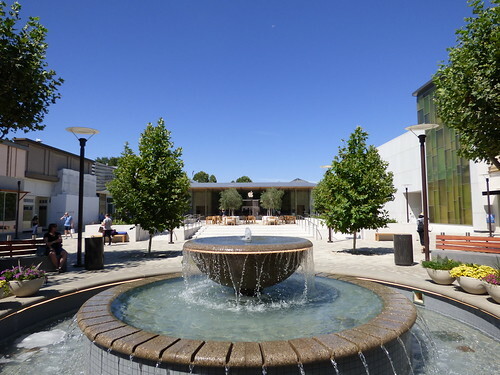 No exercise walking today, instead I spend time taking pictures in Walnut Creek, especially around the new Apple Store. I also spend time shopping at Antioch’s Target, again walking with a cane not walking sticks. The end result, Back Shoulder Pain. By the time I got home the pain was less noticeable. Since I had promised Mary, our neighbor, to fix her sprinkler system, I did so. It took more time then I had thought it would take, even with her grandson Brendon helping. Again I overdid it activating the Shoulder Pain again. I went back home to rest and lower the pain level, which took some time. Before I knew it was dinner time which was a tuna sandwich. We ended the evening by watching a movie and some TV before calling it a day. That is it for today, in summary, the day was overall another good day even with some Shoulder Pain.